Immerse yourself in the sights and sounds of exotic, spiritual India. "Asha Goes To India" captures the essence of what India is to me. The masterful and breathtakingly beautiful combination of visuals and soundtrack are so evocative that I'm instantly returned to the place I love. There is a point in the movie where I burst into joyful tears every time I see it. Navin Kulshreshtha succeeds in conveying the depth of a truly rich and poignant journey and "Asha Goes To India" is not to be missed. Navin has beautifully woven music and visual, interlaced with humour in "Asha goes to India." It is both a lovely travelogue as well as a phase in Asha’s spiritual journey. I especially enjoyed the bits depicting the reality of traveling as well as the spiritual journey. I loved the ending where India becomes the catalyst for Asha to appreciate where she is now. This film gets to the heart of one American's authentic spiritual experience. 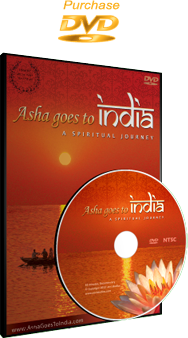 I just watched "Asha goes to India" and loved it. Very well done, beautiful scenes..Gosh even recognized the market in Delhi (I believe it was Pahar Ganj), and wonderful music.